Ikee Gardner (pictured top left), a double major in Economics and English, shares her experience working in Korea and offers suggestions for current and prospective economics students in the interview below. What have you done since graduating in 2008? After graduation, I worked in Chicago at a small financial marketing firm that represented three futures traders in all client services and communications aspects. My economics major prepared me very well for that position. 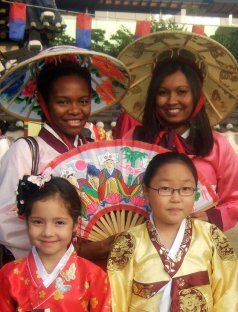 In May 2009 I made the decision to travel - backpacking through Europe for a month, and then coming to South Korea. Economics majors should know that the world is open to them - as liberal arts graduates, they have many career choices in addition to business and finance. I live in Yeongdo Island, in Busan, South Korea where I'm a middle school English teacher in the public school system. Teaching English as a foreign language requires me to be a public speaker, an adventurer and a cultural ambassador all at the same time. It's great! Living in a different culture is like solving a puzzle. It takes some time to get customs, traditions and taboos right - but every effort is fun, and every day is a learning process. Tell us what you have learned about economics through your work in Korea. The Korean government is currently investing large amounts of money in hiring English-speaking foreigners in public and private schools. In order to attract foreign teachers, the amount of compensation must sound reasonable when the amount of KRW (Korean won) is converted to dollars. But Korean teachers are paid only what is reasonable considering the (low) cost of living in Korea. Therefore, there is a large wage gap between foreign English-teachers and Korean-born English teachers, in favor of the foreign teacher. One wonders how long this strategy can continue, as there is no replenishment mechanism to replace the government's investment in foreign teachers (besides the possibility that English fluency will facilitate the development of intellectual capital in Korea in the long term). A black-market phenomenon has also developed. It is illegal for English teachers to pursue part-time tutoring jobs for pay. Those who break the law are part of the black market of English teachers who accept cash for illegal work. I haven't been able to figure out the incentives for an English teacher to join this black market, since the consequences - deportation from Korea - are quite high. What would you tell a student considering majoring in economics at Duke? Go for it! The economics major offers you many options in your focus of study. If you think you are interested in business, finance, economic theory or economic history, take an econ class to see if the major is for you. My experience was that the elective econ courses were much more engaging than the introductory classes (although the introductory classes were necessary to learn the basics). So, students should be patient and absorb as much as possible in the introductory courses, knowing that more intriguing classes will come later. What was your favorite economics class at Duke? I loved "The History of Economic Thought" taught by Craufurd Goodwin. I was a University Scholar at Duke, and the University Scholars Program (USP) always emphasized interdisciplinarity. Scholars in the USP were strongly encouraged to double-major and/or to investigate the links between seemingly different fields of study. "The History of Economic Thought" represented the perfect link between English and Economics. In that class, I found the intellectual freedom to treat economic works as if they were literature. What was your toughest economics class at Duke? "Corporate Finance" with Connel Fullenkamp. I took the class to challenge myself, and it worked! Hmmm... good question! After another year or two of travel, maybe law school, and/or a Ph.D.? I'm only 21, so I have some time to think about this. You can see more photos of Ikee in Korea at her web photo album. She is glad to answer individual questions from Duke students considering living or working in Korea. Send Ikee an email.